Manaslu trek is one of the popular treks in Nepal. 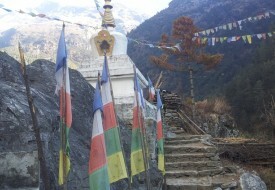 Now it is used as alternative trek to Annapurna region because of the road structure. This trek begins from Soti khola in Gorkha. On the way to the trekking, a marvelous view of Mt. Manaslu (8,163 m.) and eight tallest mountains in the world can be observed. This geography provides a chance see rich local cultural heritages as well as varied biological diversity. Highest point of this trek is Larkya – la pass 5,160 m. It is claimed to be one of the most beautiful pass in Nepal. Before this pass, trekking route follows Budi Gandaki valley. The itinerary is developed for 17 days trek. Mountain and Larkya la pass. Day 02-Sightseeing in Kathmandu and preparation for Trek and Permit.